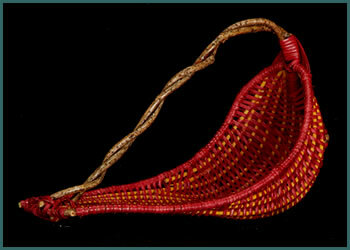 The basket styles that are pictured below can be woven for you in the size and colors of your choice. 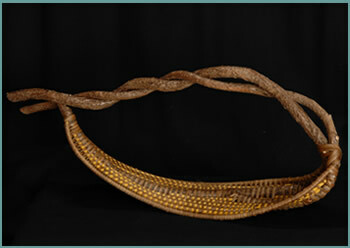 Tina always has some baskets available for immediate sale. Please contact Tina directly to make a purchase or commission her to make you a custom basket. 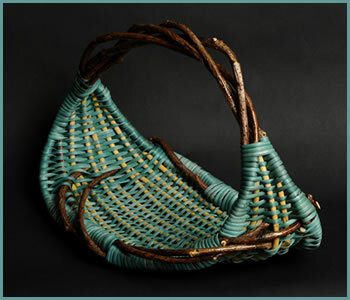 H 10" W 10" D 10"
Twisted bittersweet forms the frame of this basket, which is woven with aquamarine-colored reeds and yellow spokes. H 10" W 16" D 6"
Two pieces of bittersweet intertwined form the handle. Woven in wine-colored reeds, with yellow spokes. H 11" W 28" D 8"
A nice twisted piece of bittersweet makes the handle of this basket. Woven in smoke-colored reed, with yellow spokes.